The agenda for the 2019 Spring Conference at the UNM Rotunda can be found HERE. We will have a full day of wonderful speakers and vendor exhibits. Parking at the UNM Rotunda parking garage will require a validation code. If you have a problem contact UNM Transportation Services at 505-277-1938. 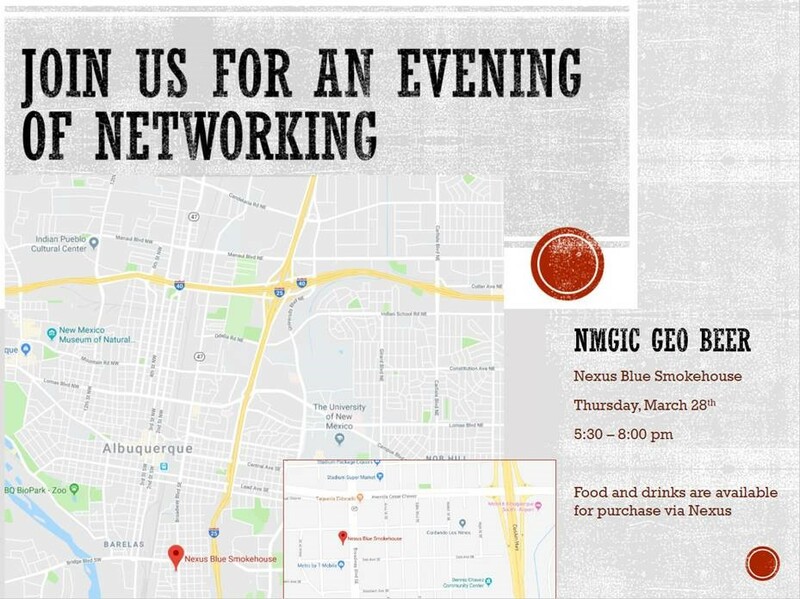 Come join us for an evening of food, beer, and networking with other geo-folks! You know you want some brisket tacos! We are excited to announce the NMGIC Spring Conference! We are putting together an exciting agenda and will forward more information soon! The NMGIC Fall 2018 Workshop will take place at the UNM Rotunda on Thursday, November 8, 2018 from 1:00-4:30pm. We hope to see you there! Meeting Theme: Living, Breathing, GIS – A look at our natural resources. The NRCS New Mexico office has published a new LiDAR status map available here.